When I arrived in the dx-schack the first Japanese stations for the season were heard. A short time later (well before 22 UTC) some Brazilians came through, and they went stronger and more of them. About the same time the first La Plata-stations were heard and some of them soon went to ”quite i” strength as 1350 Buenos Aires and 1070 El Mundo. But eg Radio Zorilla 1400 has never been heard so strong by me. The NA stations then took over, together by some Cuban and other West Indian stations and a few Venezuela/Colombia. At about 04 UTC most of the band died, however. And although the very crowded band, to my dissapointment there were not so many new catches. Not much to tell you about from the morning August 25th... Signals on most channels, but theywere ”fluttering” between NA (first) and some from WI and YV/HJ. When you returned to a channel 10 seconds later there was something different... Mostly the signals also were rather weak on a very noisy band. A little later (when the band was almost dead) at about 04 UTC there was a short opening towards La Plata. Not so noisy on that antenna and almost ”decent” signals for a few m inutes on eg 920, 1030, 1190, 1350 and 1620. As early as at about 21 UTC there were some ”mumble” on many frequencies and with the Brazilian on 740 clearly readable. At 21.30 El Mundo 1070 was heard. But then the signals disappeared. I started again at 0130 UTC with strong signals on many frequencies, most of them Spanish taling but also some NA´s (mainly eastern Canada. Dominating, however, were stations in Colombia, many with surprisingly good signal although there were in many cases two or more stations interfering. Nothing from La Plata or west of the Andes. 1370 20.8 0243 HJKX Radio Mundial Autentica, Bogota dominerade, men två till spansktalande på frekvensen. JE. Here the latest and at the same time last extra newsflash for this month. The Foundation Norderney presents 50 Years of Radio Veronica. During the whole month of August the programming from the internet radiostation Veronica 192.nl pays attention to the fact Veronica was registrated as an offshore radio station in 1959 and started broadcasts in April 1960. Also the month of August remembers the Dutch people to the fact in 1974 on the 31st there came an end to the offshore broadcasts from the station. Up till midnight on August 31st you can listen to old Veronica programmes on http://www.veronica192.nl/ as well on 1584 AM on the frequency of Radio Paradise in certain parts of Holland. ARC Newsflash: HM i TV! En av de trogna ARC-medlemmarna, Hasse Mattisson-HM, medverkar fredagen den 21.8 kl 19.50 och 2215 i programmet "Bästa Läget" som sänds över SVT:s Smålandsdistrikt. För er som inte kan se programmet direkt så går det bra att kolla på www.svt.se/smalandsnytt . Inspelningen är gjord ute i HM:s QTH Johansberg och naturligtvis berättar han om vår hobby som väl i dag kan synas aningen exotisk för många. Still not much to tell you about from the schack in Fredriksfors. Propagation is favouring NA-stations although they can´t get through properly due to the light. Still quite a few this morning, with ”first for season” for eg 930, 1030, 1050, 1200, 1390, 1410, 1430 and some X-banders. Also a few YV/HC stations, but only weak signals from La Plata on 920, 950, 1070 and 1350. A music station on 1290 showed up to be from Brazil but no id, almost no spoken words at all... Radio Corporación, Chile on 1380 is often a good exampel when conditions are generally lousy. So also this time. 1190 14.8 0200 HJCT La Voz de la Costa, Barranquilla med religiöst. Where were you August 31st 1974? Many people know where they were when J.F. Kennedy was shot dead in Dallas. Some people close their eyes and they can still see the first man walking on the moon. Those are historic events that we can relive time after time thanks to DVD, video, MPeg4, I-pods and whatever. You see the same and still.... it's different. A lot of people in The Netherlands, who were over twelve in August 1974, can remember where they were during the close down of Radio Veronica, the most popular radio station The Netherlands ever had. 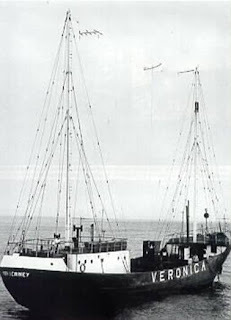 Radio Veronica was firstly a ship based radio station, started broadcasting in 1960 from a former German light vessel anchored outside the territorial waters in the North Sea. At that time radio in Holland only consisted of Government controlled broadcasting companies radiating programs as exciting as watching grass grow. In 1959 a couple of entrepreneurs decided to follow the Scandinavian example of broadcasting, which was "free" radio from outside the jurisdiction of the authorities. Free of charge, free of Governmental interference and available at no costs. The content of these stations? Music! Radio Veronica, as the station was called, built up an audience beyond believe and forced the Government to launch a new National radiostation (Hilversum III) broadcasting mainly pop music all day as a (non successful) attempt to take away the reason for Veronica's success (broadcasting what young Europe wanted, namely pop music only). It was that same success that made the authorities reticent to act as no political movement had the courage to jeopardize an election over the popularity of Radio Veronica. It took a shot in her own feet that eventually gave the authorities an excuse to stop Veronica. An explosion on board a competeting radio ship pushed the Government into gear. After September 1st 1974 any working for, supporting of and advertising on offshore stations would be illegal. Radio Veronica decided to cease broadcasting August 31st 1974 at 6pm (CET). From then on the frequency of 538 meters, 558 kHz AM was silent until much later other stations started using it. Another bad night, and after that a couple (or more) of hours with collecting fire wood and cutting bushes in the vicinity of the dx-schack. I started listen at about 01.15 UTC. Canadians as 590, 740, 750, 800, 1140, 1400 and with 740 with VOCM-programming as the strongest. A very good and lasting signal from Radio Apolo 1320. 1350, 1620 but only 1070 and 1350 barley readable. The exception was Peru on 1400 and more common 1500. 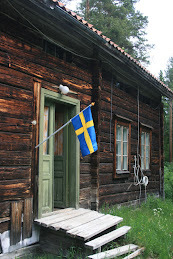 The signals are not propagating as good as I hope this far.Last visit to the schack in Fredriksfors was no exception. Only very few signals and at low signal strenght, However, there was some ”hope” this night as I had Radio El Mundo 1070 and Radio America 1190 in Buenos Aires at good strength already at 23 UTC. But most signals fadaded away instead of increasing towards sunrise. Fredriksfors August 1 and 3 I have listened two mornings (August 1st. and 3rd.) in the schack at Fredriksfors (together with Rolf Larsson). First night some NA signals at first at 01.15 UTC, but later some La Plata and Brazilian stations took over. Very few signals readable, however.A little better signals (and also more of them) August 3rd., but still few strong enough to be identified as far away thunder storms were raging. 1290 3.8 0227 OID religiös brasse. Ganska stark stundtals men inget identifierbart. Venezuela's dictator has - in the words of typical left-wing jargon -"brought back to the people" 34 radio and TV stations. This is only the beginning and further infringements can be expected. * Upata: Canal 7 TV, José David Natera. * Ciudad Bolívar: 96,9 FM, Ramón Rafael Castro Mata. * Valencia: 100,1 FM, Nelson Belfort Dividin. * Puerto Cabello: 98,3 FM, Pedro Ezequiel Listuit. * 1520 AM, Guillermo Obel Mejías. RADIO BONITA "LA GUAPA"* Emisora FM, Guillermo Obel Mejías. * 1550 AM, Monseñor Bernando Heredia (extinción por fallecimiento). RADIOMETROPOLITANA* 97,1 FM, Monseñor Bernando Heredia. * 92,1 FM, Gabriel Robinson, Charallave. * 1230 AM, Radio Barlovento, Caucagua. RADIO BARLOVENTO* 96,9 FM, Carlos Herci, El Hatillo. * 730 AM, Modesto Marchena. RADIO FRONTERA* 94,5 FM, Arturo Álvarez Leal. * Canal 26 UHF, Catia La Mar. * 106,9 FM, Alcides Delgado. * 105,1 FM, Guido Briceño. * 102,1 FM, Luis Guillermo Gouvea. * 1430 AM, Ciro Ávila Moreno, Ciudad Ojeda. RADIO REGIONAL? LISTAD PÅ 1330!! * 1300 AM, Moisés Portillo, Santa Cruz de Mar. RADIO AMISTAD? (Source: Globovision; I have added the names of the AM stations which are known to us.). The names applies to the owner and/or the license holder, the person who has kindly signed the document saying that his station will be closed down. Some stations, like the anti-government CNB, owned by the president of the Cámara Nacional de Radio yTelevisión, continues to broadcast over the internet.